Shown with white frame and black upholstery. GymRatZ Commercial Gym Equipment is designed for professional use in health clubs, fitness centres, and the very toughest of gyms. The equipments ability to withstand constant daily use is second to none- we wouldn't put our name to anything else! GymRatZ Chin/ Dip/ Knee Raise Station is basic in design and solid. Constructed from heavy gauge steel with thick durable upholstery. NOTE: Our Chin/ Dip/ Knee Station is now fitted with a crossbar for those wishing to perform reverse grip chins. All GymRatZ Gym Equipment comes as standard with black upholstery and yellow, white or silver frame. Other colours are available on request for an additional charge - please call for details and costings. 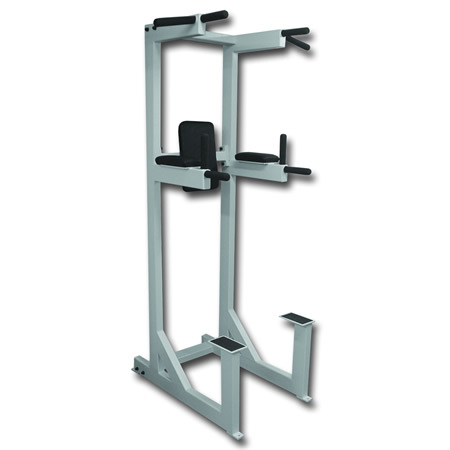 All GymRatZ Gym Equipment is made to order and subsequently each order regarded as a special order. This means that lead times will vary and we request genuine orders and enquiries only. GymRatZ Gym Equipment does not come flat packed with assembley instructions. Subsequently, we cannot provide a price for delivery and installation until we are in receipt of your full address and required items. Lifetime on Framework, 2 years on all bearings and other moving parts, 1 year on cables. Service Contracts Available - Please call for details. 10% OFF COMMERCIAL MATTING when ordered with this product. This item excludes delivery/ installation charge. Dimensions (mm): 900 L; 600 W; 2100 H.
This item excludes delivery & installation charges. Delivery and Installation charge is subject to location and items ordered. GymRatZ will contact you before taking payment to confirm the chargeable ammount. Frame Colour YellowSilverWhiteOther - see note.